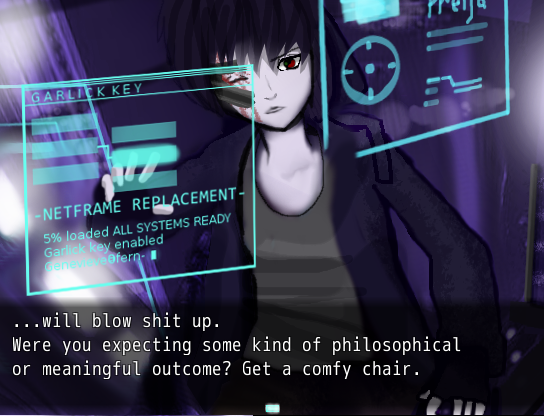 You Should Play Vindictive Drive. "She who lives by the grudge." I knew that when Balthasar was going to make a new game it was going to be one with twists, turns, and that it would leave an impact. I was very excited to play Vindictive Drive, however, I never got to it until recently, and I am certainly glad I did! One of my favorite things about Balthasar’s games is that he sets up his characters in a way to make us feel like we should care about them, and that gives us an incentive to keep playing. The plot in Vindictive Drive is about Arris getting her revenge against her father, Charles Mourne. We see in Vindictive Drive that Charles was not only an abusive and terrible father, but he also killed Arris’s mother. This action sets everything into play. As you play as Arris and meet more key people, there are multitudes of decisions you can make. These decisions affect the story heavily. You can make Arris an extremely cruel and merciless killer, or you can make Arris some who is revenge driven, but still human. There is multiple choices and branches, so replaying the game wouldn’t be a completely new experience, but I’d say it’s satisfying enough to replay to get all of the endings and experiencing the different routes. My playthrough took about two hours and fifty-four minutes, so it is a fairly short game. If you wanted, you could probably get all of the endings in a mere couple of hours. There’s lots of characters in Vindictive Drive, and throughout all of the characters, I wouldn’t say any of them are too similar. They all have their own unique traits, appearances, and identities. Arguably the best character in the game, Arris, is the most dynamic as the story advances. Arris is a very anti-hero character. This can be a turn off by some, especially since she’s introduced to us as a deadpan snarker and a mostly aloof girl. As she develops more in the story, particularly the good karma route, her heart starts to soften up and she starts to care more about the people she’s using in her pursuit of revenge. This is something I really enjoyed as I played through the game. It was so awesome to see her grow, to see her care for others, and start to feel again. I enjoyed the writing a lot. Vindictive Drive is a very story driven game and has lots of cutscenes which greatly helps to immerse us within its world. The game is very dark and has lots of intense moments within it. Like Arris title says, “She lives by the grudge,” and DAMN. This part really shows through. Arris is willing to do anything or use anyone to get what she wants. Since the game can get really dark at times, there are a lot of light-hearted and funny moments too. I think this helps ease the tension at times and help us get more invested into the characters as well. The gameplay in Vindictive Drive I’d say is a combination of stealth and action. As Arris, you mostly hack various things, avoid enemies at all cost, and fight when absolutely necessary. Later in the game, you are able to get access to two robots, Amaranth and Ophelia. Amaranth is a loud and a gunner down kind of robot, while Ophelia is like a more advanced Arris. You can also unlock the extremely overpowered Eureka, who is a blast to play. In terms of gameplay, I’d say that I wish there was more engagement on Arris’s part. The little bit of gameplay at the bank in the beginning was what I hope we had more of for Arris, it was interesting and not usually the same formula of things we see in other games. The fight scenes with Arris weren’t too bad though, and still were fun enough to keep me playing. I didn’t enjoy Ophelia’s gameplay as much, I thought she was boring, just another Arris except with mass disabling. I feel like something like a sniper main weapon (possibly aoe) would help her kit immensely and make her more enjoyable to play through. Also, yes, the Ophelia puzzle was harsh. I wish it had been more something like if you went in the wrong direction you get an auto death. Maybe once you look a monitor one enemy spawns? I don’t know. Something small like that would help a lot. As for Amaranth and Eureka, phew. They were a blast to play. I enjoyed blasting enemies from left to right. They were very fun and engaging to play as. My favorite cutscene graphic in the game. 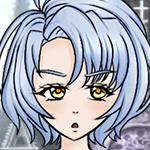 Almost every character in Vindictive Drive has a portrait, matter of fact, I can’t think of any character in the story who doesn’t have a main role who doesn’t! There’s different emotes for portraits, so we’re not looking at the same one either. Like I said earlier, every character’s appearance is unique and none of them feel too similar. The CGs, animations, and cutscenes were so awesome! There are times when I play this game where it feels like I’m watching an anime, or a movie and I’d say that’s a pretty impressive feat for a game made in RPG Maker. I really liked the soundtrack in Vindictive Drive. All of the sounds and music complimented each scene and area really well. Balthasar has a good ear for picking tracks out in his games, I really enjoyed the music. 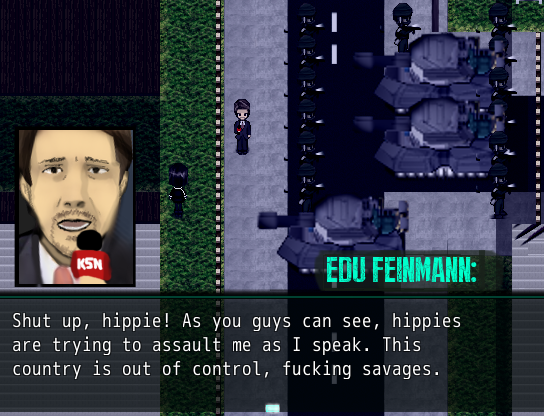 The sound effects worked well too, the guns sounded like guns, and nothing felt like it was out of place! 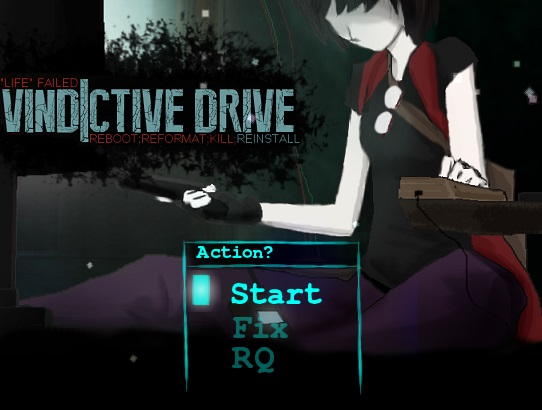 If you like dark stories, anti-heros, action, stealth based games, shooter games, neets, tsunderes, Feinmann, or story driven games then you should check out Vindictive Drive! Thank you for taking your time to play and review my game Nedras, it's long and detailed, as I said coming from you it means a lot, I will reinforce some of the game's weak points in the last update. I learned a lot from this game, and I think next time it will be a lot better. Excited to sse what's in store for the future!